Summer Sweepstakes: Enter To Win Our Summer Kick-Off Kit! THIS CONTEST HAS ENDED AS OF 6.19.2018. Not valid at these bakeries: Austin, TX., Dallas, TX., Storrs, CT., San Diego, CA. – Naval Base, Virginia Tech University, Tampa, FL., Virginia Beach, VA., North Carolina – 760 West Williams St., 10750 Wakefield Commons Dr., Cleveland International Airport, Dallas Love Field Airport, Philadelphia International Airport, Raleigh-Durham International Airport. This Sweepstakes is open to all legal residents of the United States and the District of Columbia, who are 18 years of age or older (“Entrant”) at the time of Entry (defined below). Employees, contractors, officers and directors of Bruegger’s Enterprises, Inc. (“Sponsor”), Nium, Inc., SPM Communications, Inc., and SBC Advertising, any of the Coffee and Bagel brands family including Caribou Coffee®, Noah’s New York Bagels® and Manhattan Bagel®. Einstein Bros.® Bagels (collectively, “Promotional Partners”), Facebook, and their respective parent companies, subsidiaries, affiliated or related companies, franchisees, production partners, advertising agencies, promotional suppliers (collectively, “Contest Entities”) and the immediate family members (spouses and parents, children, and siblings and their spouses) or members of the same households (regardless of whether they are related) of such individuals are not eligible for the Sweepstakes. Moreover, you are not eligible to enter and will be disqualified if: (a) you are an Entrant or other individual who deliberately damages or undermines the legitimate operation of this Contest, or (b) you make more than one (1) submission per individual during the submission period. All applicable federal, state, and local rules and regulations apply. Void in Puerto Rico and where prohibited or restricted by law. This Contest is not sponsored, endorsed, or administered by or associated with Facebook, Instagram, or Twitter. The Sweepstakes period begins on June 4, 2018 at 6:00 AM Eastern Time (“ET”) and ends on June 19, 2018 at 11:59 PM ET (“Sweepstakes Period”). To enter the Sweepstakes, during the Sweepstakes Period, complete the sign-up form at www.brueggers.com/contest. All Entrants who submit a valid Entry during the Sweepstakes Period will receive one (1) entry into the Sweepstakes and an offer for $2 Off $5 purchase. Entrants may only enter one (1) time during the Sweepstakes Period. Valid Entries must be submitted via the online method as described above. All Entries must be received during the Sweepstakes Period as determined by the computer time on Sponsor’s server. Any attempt by a participant to obtain more than the allowable Entries by using multiple/different e-mail addresses, identities or any other methods will void all of that Entrant’s entries. By entering, the Entrants agree to comply with these Official Rules, including all eligibility requirements. Sponsor reserves the right to verify eligibility of all Entrants. Illegible and/or incomplete Entries and Entries submitted by Entrants who do not meet the eligibility requirements (including all requirements with respect to age and residence) are void. Proof of entering information at website does not constitute proof of delivery or receipt of an Entry. Sponsor reserves the right to modify the Sweepstakes schedule without prior notification. Use of computer programs, macro, programmed, robotic, automatic and other similar means to enter the Sweepstakes is prohibited and may result in the disqualification of Entries and/or the Entrant. In the event of a dispute regarding the identity of the person submitting an Entry, the Entry will be deemed to be submitted by the person in whose name the e-mail account is registered on the date the Entry is submitted. All Entries and other submitted material become Sponsor’s sole property and will not be acknowledged or returned. By submitting an Entry, you grant the Sponsor and its affiliated companies the unconditional, exclusive, and perpetual right and permission to reproduce, encode, store, copy, transmit, publish, post, broadcast, display, publicly perform, adapt, modify, create derivative works of, exhibit, and otherwise use the Entry or part thereof, with or without using your name, in any manner throughout the world for any purpose, without limitation, and without additional review, compensation, or approval from you or any other party. By way of example, but not by way of limitation, the Sponsor may display your Entry on the Internet (e.g., www.brueggers.com). By entering the Sweepstakes you are opting-in to receive communications regarding news, offers and promotions from the Sponsor as part of their Inner Circle program. You may ask to stop receiving communication from the sponsor at any time. The Sponsor agrees that they will not rent or sell the information contained in any Sweepstakes entries. You agree that the Sweepstakes Entities are not responsible for any unauthorized third-party use of any Entry. Entries will not be acknowledged and will not be received or held “in confidence”; a submission does not create a confidential relationship or obligation of secrecy between you and the Sponsor or any of the Sweepstakes Entities. You agree that, upon Sponsor’s request, you will sign a release of claims in a winner’s affidavit affirming your compliance with the Sweepstakes Rules (prepared at the sole discretion of Sponsor). By submitting an Entry, you further agree not to instigate, support, maintain, or authorize any action, claim, or lawsuit against the Sweepstakes Entities or any other person or entity, on the grounds that any use of the Entry, or any derivative works, infringes any of your rights, including, without limitation, copyrights and moral rights. Nothing in these official rules constitutes an employment, joint venture, or partnership relationship between you and the Sweepstakes Entities. In no way are you to be construed as the agent or to be acting as the agent of the Sponsor. Entries must not include materials (e.g., photos, language, phrases, quotations, etc.) owned, trademarked, or copyrighted by third parties and such Entries will be disqualified. Entries must not contain the name of any fictitious character(s) or any person other than that of the Entrant. Entries must not contain or depict any defamatory, obscene, sexually-explicit, abusive, harassing, hateful, discriminatory, threatening, or vulgar material and must be otherwise fit for publication/posting/uploading, as determined by Sponsor in its sole discretion. Entries must not contain any material that infringes upon any personal, proprietary, or any other right of any third party. Entries must contain the first name, last name, address and phone number, city, state, birthday and email address of only the Entrant. Entries must not contain any references to tobacco, drug paraphernalia, or any description or representation thereof. Entries must not contain any unsolicited or unauthorized advertising, promotional materials, or any other form of solicitation. Sweepstakes Entries that are incomplete, garbled, corrupted, or unintelligible for any reason, including, but not limited to, computer or network malfunction or congestion (including, without limitation, at Sponsor’s, Promotional Partners’ and/or any other entity’s servers), are void and will not be accepted. Sponsor will conduct a random drawing of five (5) valid Entries during the Sweepstakes Period. 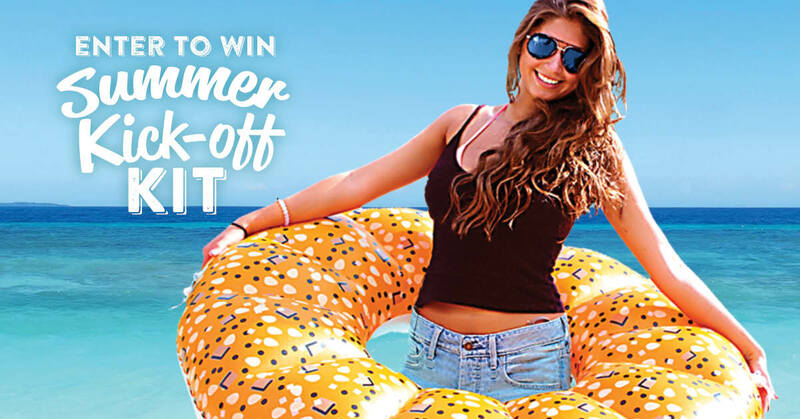 Each prize consists of one Everything Bagel inflatable, one Bruegger’s Bagels Tumbler Cup, one Beach Towel, one Chapstick, one Bruegger’s Bagels t-shirt, Free Bagels & Coffee for the Summer (total of 12 certificates good for a small drip coffee and a bagel with cream cheese) (ARV $175.00). Per-Entrant Odds of winning a Prize are one (1) out of the total number of eligible Entries received. Prizes cannot be transferred, substituted, or redeemed for cash, except at Sponsor’s sole discretion. Sponsor reserves the right to substitute a prize of comparable or greater value, at its sole discretion. Incidental costs or other expenses associated with prize acceptance and use not specifically set forth herein as being provided are the sole responsibility of the Winner (defined below). All applicable federal, state, and local taxes on the prize are the sole responsibility of Winners. All prize details are at Sponsor’s sole discretion. All taxes on Prizes and all expenses related to acceptance and use of Prizes and not specified are the sole responsibility of Winners. By participating, Entrants agree (a) to these rules and decisions of Sponsor, which shall be final in all respects relating to this Sweepstakes; (b) to release, discharge and hold harmless Sweepstakes Entities, their subsidiaries and affiliates or related companies from any and all injuries, liability, losses and damages of any kind resulting from their participation in the Sweepstakes or their acceptance, use or misuse of prize including, without limitation, personal injury, death and property damage; and if a Winner, (c) to the use of his or her name, city and state of residence for advertising, promotional, and other purposes in all media, including but not limited to on air and within www.brueggers.com, without compensation, notification, or permission, unless prohibited by law. Sponsor is not responsible for and shall not be liable for: (a) electronic, hardware or software program, network, Internet, or computer malfunctions, failures, or difficulties of any kind, including without limitation, server malfunction or for any human, typographical, printing or other error relating to or in connection with the Sweepstakes, including, without limitation, errors which may occur in the administration of the Sweepstakes, processing of entries; the announcement of the prize or in any Sweepstakes–related materials, (b) failed, incomplete, garbled, or delayed computer transmissions; (c) late, lost, misdirected or incomplete entries or postage-due mail; (d) damage to Entrants’ or any person’s computer or the contents thereof; (e) any condition caused by events that may cause the Sweepstakes to be disrupted or corrupted; or (f) any damage to prizes during shipping or delivery. Sponsor reserves the right in its sole discretion to cancel, terminate, modify, or suspend the Sweepstakes if fraud, technical failures or any other factor beyond Sponsor’s reasonable control impairs the integrity of the Sweepstakes (or portion thereof), as determined by Sponsor in its sole discretion, and Sponsor reserves the right to limit entries to those submitted prior to the action taken or to proceed in such a manner as may be deemed fair and equitable by Sponsor in its sole discretion. Any attempt by an Entrant or any individual to deliberately damage any website or undermine the legitimate operation of the Sweepstakes may be a violation of criminal and civil laws, and should such an attempt be made, Sponsor reserves the right to seek damages from any such person to the fullest extent permitted by law. In the event of a dispute as to any registration or play, the authorized account holder of the email address used to register will be deemed to be the registrant or player. The “authorized account holder” is the natural person assigned an email address by an Internet access provider, online service provider, Internet service provider or other organization responsible for assigning email addresses for the domain associated with the submitted address. Potential winners may be required to show proof of being the authorized account holder and/or proof of employment. Sponsor reserves the right, at its sole discretion, to disqualify any individual it finds to be tampering with the entry process or the operation of the Sweepstakes or the Web Site; to be acting in violation of the Official Rules; to be acting in violation of the terms of the Web Site, or to be acting in a non-sportsmanlike or disruptive manner, or with intent to annoy, abuse, threaten or harass any other person. Entries may not be made by any other individual or any entity, and/or originating at any other Internet Web site or e-mail address, including but not limited to commercial Sweepstakes subscription notification and/or entering service sites. Any winner who enters by any of the methods described above will be disqualified and an alternate winner will be selected. Use of any device to automate entry or votes is prohibited. Sponsor reserves the right in its sole discretion to disqualify any entry at any time in the event it is determined that an Entrant has not complied with these Official Rules. All entries and prize claims become the property of Sponsor and will not be returned. Released Parties (as defined below) assume no responsibility for lost, late, stolen, delayed, damaged, misdirected, undelivered, illegible, incomplete or postage-due entries, prize claims or mail. Except where prohibited, by accepting a prize, winners consent to the use by Sponsor and its designees of their names and/or photographs for advertising and publicity purposes in any and all media now or hereafter known throughout the world in perpetuity without limitation and without additional compensation, notification or permission. By participating in this promotion, each entrant accepts and agrees (i) to be bound by these Official Rules and the decisions of the Sponsor, which shall be final and binding in all respects, and (ii) to release Sponsor, Promotional Partners, and their parents, subsidiaries, affiliates and advertising and promotion agencies, and the respective directors, officers, employees and agencies of the foregoing (collectively, the “Released Parties”) from any and all liability of any injuries, losses or damages of any kind caused by participating in this promotion or resulting from acceptance, or use/misuse of the prize. Entries generated by script, macro or other automated means will be void. Sponsor reserves the right at its sole discretion to disqualify any individual that tampers or attempts to tamper with the entry process or the operation of the promotion, violates the Official Rules, or acts in an unsportsmanlike or disruptive manner, or with intent to annoy, abuse, threaten or harass any other person. CAUTION: ANY ATTEMPT BY AN ENTRANT OR ANY OTHER INDIVIDUAL TO DELIBERATELY DAMAGE ANY WEBSITE RELATED TO THE PROMOTION OR TO UNDERMINE THE LEGITIMATE OPERATION OF THE PROMOTION IS A VIOLATION THE SWEEPSTAKES RULES AND OF CRIMINAL AND CIVIL LAWS, AND SHOULD SUCH AN ATTEMPT BE MADE, SPONSOR RESERVES THE RIGHT TO SEEK DAMAGES (INCLUDING ATTORNEYS’ FEES) FROM ANY SUCH INDIVIDUAL TO THE FULLEST EXTENT PERMITTED BY LAW. Released Parties are not responsible for technical, hardware or software malfunctions, telephone failures of any kind, lost or unavailable network connections, or failed, incorrect, inaccurate, incomplete, garbled or delayed electronic communications whether caused by the sender or by any of the equipment or programming associated with or utilized in this promotion which may limit the ability to participate or by any human error which may occur in the processing of entries in this promotion. Sponsor reserves the right to modify, terminate, or suspend the online entry should virus, bugs, non-authorized human intervention or other causes corrupt the administration, security, fairness, or proper play of the promotion. These Sweepstakes rules constitute the full agreement relating to the promotion. In the event of any conflict between these rules and any of the documents relating to the promotion, these rules shall prevail. You acknowledge that the promotion is in no way sponsored, endorsed or administered by, or associated with Facebook, Instagram, or Twitter. You understand that you are providing your information to Sponsor and not to Facebook, Instagram, or Twitter. The information you provide will only be used for the Sweepstakes. You agree to release Facebook, Instagram and Twitter from all liability relating to this promotion. You will indemnify and hold Facebook, Instagram, and Twitter harmless from and against all damages, losses, and expenses of any kind (including reasonable legal fees and costs) for any claim related to the promotion including without limitation the publicity or administration thereof. Each Entrant agrees that: (1) any and all disputes, claims, and causes of action arising out of or in connection with this promotion, or any prizes awarded, shall be resolved individually, without resorting to any form of class action, and any judicial proceedings shall take place in a federal or state court within the State of Texas; (2) any and all claims, judgments, and awards shall be limited to actual out-of-pocket costs incurred, excluding attorneys’ fees and court costs; (3) under no circumstances will Entrant be permitted to obtain awards for punitive, incidental, and consequential damages, and any other damages, other than for actual out-of-pocket expenses, and any and all rights to have damages multiplied or otherwise increased, and Entrant hereby waives all rights to claims for such damages; and (4) that all causes of action arising out of or connected with this Promotion, or any prize awarded, shall be resolved individually, without resort to any form of class action. All issues and questions concerning the construction, validity, interpretation and enforceability of these Official Rules, or the rights and obligations of Entrant and Sponsor in connection with the promotion, shall be governed by, and construed in accordance with the laws of the State of Texas, without giving effect to any choice of law or conflict of law, rules or provisions (whether of the State of Texas, or any other jurisdiction), that would cause the application of the laws of any jurisdiction other than the State of Texas. LIMITATION OF LIABILITY; DISCLAIMER OF WARRANTIES; PRODUCT DISCLAIMERS. IN NO EVENT SHALL SPONSOR, ITS RELATED ENTITIES, OR PROMOTIONAL PARTNERS BE LIABLE TO ANY ENTRANT OR WINNER FOR DAMAGES THAT EXCEED THE VALUE OF THE PRIZE TO BE AWARDED TO ANY INDIVIDUAL ENTRANT IN THIS GIVEAWAY. WITHOUT LIMITING THE FOREGOING, THIS PROMOTION AND ALL PRIZES ARE PROVIDED “AS IS” WITHOUT WARRANTY OF ANY KIND, EITHER EXPRESS OR IMPLIED, INCLUDING BUT NOT LIMITED TO, THE IMPLIED WARRANTIES OF MERCHANTABILITY, FITNESS FOR A PARTICULAR PURPOSE OR NON-INFRINGEMENT. SOME JURISDICTIONS MAY NOT ALLOW THE LIMITATIONS OR EXCLUSION OF LIABILITY FOR INCIDENTAL OR CONSEQUENTIAL DAMAGES OR EXCLUSION OF IMPLIED WARRANTIES SO SOME OF THE ABOVE LIMITATIONS OR EXCLUSIONS MAY NOT APPLY TO YOU. CHECK YOUR LOCAL LAWS FOR ANY RESTRICTIONS OR LIMITATIONS REGARDING THESE LIMITATIONS OR EXCLUSIONS. THE INFLATABLE “EVERYTHING BAGEL” FLOAT PRIZE IS FOR RECREATIONAL USE ONLY, IT IS NOT A LIFE-SAVING DEVICE, AND CHILDREN SHOULD BE SUPERVISED AT ALL TIMES. For a list of winners, mail a self-addressed, stamped envelope to be received by July 31, 2018, to: Bruegger’s Enterprises, Inc., Attn: Marketing, 2610 E FM 544, Suite 104 Wylie, Texas 75098.